If you wish to bring about a breach in the system, then you have got to apply dynamite to the Vedas and the shastras, which deny any part to reason; to the Vedas and shastras, which deny any part to morality. In 1936, Dr. Babasaheb Ambedkar was asked to speak at the annual conference of the Jat-Pat Todak Mandal, a Hindu anti-caste reformation group. However, when he sent them the text of the speech he would give, they wrote back appalled, asking him to edit out large tracts of the speech which were considered ‘unbearable’. Not only did he reject this ironic attempt at censorship by the very community he was calling to account, but he went on print 1500 copies at his own expense, and the text was soon translated into six languages. Today, the work occupies a seminal place in the literature that has defined the anti-caste movement. 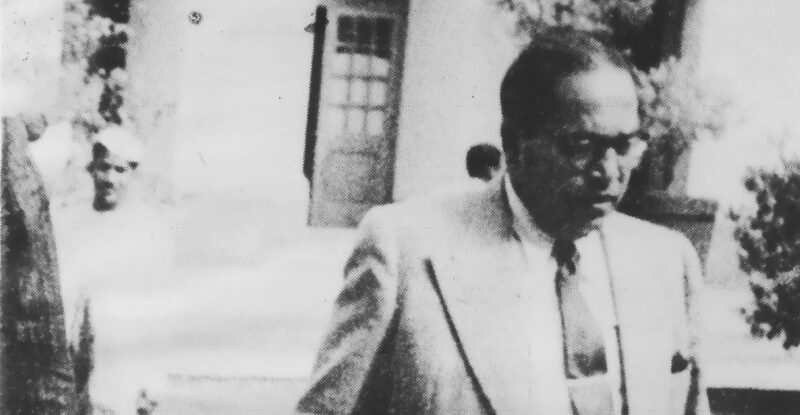 In this excerpt, Ambedkar deconstructs the oppressive formulations of Manu and calls attention to the Vedas’ inconsistency with an academically rigorous scorn. He points out the attention that has been paid to hold stricture above rationality, and calls for the complete rejection of the religious sanctity of codified Hinduism as an ethical imperative. But the artful way in which the social and religious rights are distributed among the different castes, whereby some have more and some have less, makes the slogan of Karl Marx quite useless to excite the Hindus against the caste system. Castes form a graded system of sovereignties, high and low, which are jealous of their status and which know that if a general dissolution came, some of them stand to lose more of their prestige and power than others do. You cannot, therefore, have a general mobilisation of the Hindus (to use a military expression) for an attack on the caste system. Here there is no place for reason to play its part. A Hindu must follow either Veda, smriti or sadachar. He cannot follow anything else. According to this rule, rationalism as a canon of interpreting the Vedas and smritis is absolutely condemned. It is regarded to be as wicked as atheism, and the punishment provided for it is excommunication. Thus, where a matter is covered by the Veda or the smriti, a Hindu cannot resort to rational thinking. He must abide by their directions. Caste and varna are matters which are dealt with by the Vedas and the smritis, and consequently, appeal to reason can have no effect on a Hindu. So far as caste and varna are concerned, not only the shastras do not permit the Hindu to use his reason in the decision of the question, but they have taken care to see that no occasion is left to examine in a rational way the foundations of his belief in caste and varna. It must be a source of silent amusement to many a non-Hindu to find hundreds and thousands of Hindus breaking caste on certain occasions, such as railway journeys and foreign travel, and yet endeavouring to maintain caste for the rest of their lives! The explanation of this phenomenon discloses another fetter on the reasoning faculties of the Hindus. Man’s life is generally habitual and unreflective. Reflective thought—in the sense of active, persistent, and careful consideration of any belief or supposed form of knowledge, in the light of the grounds that support it and the further conclusions to which it tends—is quite rare, and arises only in a situation which presents a dilemma or a crisis. Railway journeys and foreign travels are really occasions of crisis in the life of a Hindu, and it is natural to expect a Hindu to ask himself why he should maintain caste at all, if he cannot maintain it at all times. But he does not. He breaks caste at one step, and proceeds to observe it at the next, without raising any question. The reason for this astonishing conduct is to be found in the rule of the shastras, which directs him to maintain caste as far as possible and to undergo prayaschitta when he cannot. By this theory of prayaschitta, the shastras, by following a spirit of compromise, have given caste a perpetual lease on life, and have smothered the reflective thought which would have otherwise led to the destruction of the notion of caste. There have been many who have worked in the cause of the abolition of caste and untouchability. Of those who can be mentioned, Ramanuja, Kabir, and others stand out prominently. Can you appeal to the acts of these reformers and exhort the Hindus to follow them? As though to warn people against the view that sadachar means good acts or acts of good men, and fearing that people might understand it that way and follow the acts of good men, the smritis have commanded the Hindus in unmistakable terms not to follow even gods in their good deeds, if they are contrary to shruti, smriti and sadachar. This may sound to be most extraordinary, most perverse, but the fact remains that न देवचरितमं चरेत् is an injunction issued to the Hindus by their shastras. Reason and morality are the two most powerful weapons in the armoury of a reformer. To deprive him of the use of these weapons is to disable him for action. How are you going to break up caste, if people are not free to consider whether it accords with reason? How are you going to break up caste, if people are not free to consider whether it accords with morality? The wall built around caste is impregnable, and the material of which it is built contains none of the combustible stuff of reason and morality. Add to this the fact that inside this wall stands the army of Brahmins who form the intellectual class, Brahmins who are the natural leaders of the Hindus, Brahmins who are there not as mere mercenary soldiers but as an army fighting for its homeland, and you will get an idea why I think that the breaking up of caste among the Hindus is well-nigh impossible. At any rate, it would take ages before a breach is made. But whether the doing of the deed takes time or whether it can be done quickly, you must not forget that if you wish to bring about a breach in the system, then you have got to apply dynamite to the Vedas and the shastras, which deny any part to reason; to the Vedas and shastras, which deny any part to morality. You must destroy the religion of the shrutis and the smritis. Nothing else will avail. This is my considered view of the matter. Some may not understand what I mean by destruction of religion, some may find the idea revolting to them, and some may find it revolutionary. Let me therefore explain my position. I do not know whether you draw a distinction between principles and rules. But I do. Not only do I make a distinction, but I say that this distinction is real and important. Rules are practical; they are habitual ways of doing things according to prescription. But principles are intellectual; they are useful methods of judging things. Rules seek to tell an agent just what course of action to pursue. Principles do not prescribe a specific course of action. Rules, like cooking recipes, do tell just what to do and how to do it. A principle, such as that of justice, supplies a main heading by reference to which he is to consider the bearings of his desires and purposes; it guides him in his thinking by suggesting to him the important consideration which he should bear in mind. This difference between rules and principles makes the acts done in pursuit of them different in quality and in content. Doing what is said to be good by virtue of a rule and doing good in the light of a principle are two different things. The principle may be wrong, but the act is conscious and responsible. The rule may be right, but the act is mechanical. A religious act may not be a correct act, but must at least be a responsible act. To permit of this responsibility, religion must mainly be a matter of principles only. It cannot be a matter of rules. The moment it degenerates into rules it ceases to be religion, as it kills the responsibility which is the essence of a truly religious act. What is this Hindu religion? Is it a set of principles, or is it a code of rules? Now the Hindu religion, as contained in the Vedas and the smritis, is nothing but a mass of sacrificial, social, political, and sanitary rules and regulations, all mixed up. What is called religion by the Hindus is nothing but a multitude of commands and prohibitions. Religion, in the sense of spiritual principles, truly universal, applicable to all races, to all countries, to all times, is not to be found in them; and if it is, it does not form the governing part of a Hindu’s life. That for a Hindu dharma means commands and prohibitions is clear from the way the word dharma is used in the Vedas and the smritis and understood by the commentators. The word dharma as used in the Vedas in most cases means religious ordinances or rites. Even Jaimini in his Purva Mimamsa defines dharma as “a desirable goal or result that is indicated by injunctive (Vedic) passages”. Put in plain language, what the Hindus call religion is really law, or at best legalised class-ethics. Frankly, I refuse to call this code of ordinances as religion. The first evil of such a code of ordinances, misrepresented to the people as religion, is that it tends to deprive moral life of freedom and spontaneity, and to reduce it (for the conscientious, at any rate) to a more or less anxious and servile conformity to externally imposed rules. Under it, there is no loyalty to ideals; there is only conformity to commands. But the worst evil of this code of ordinances is that the laws it contains must be the same yesterday, today and forever. They are iniquitous in that they are not the same for one class as for another. But this iniquity is made perpetual in that they are prescribed to be the same for all generations. The objectionable part of such a scheme is not that they are made by certain persons called prophets or law-givers. The objectionable part is that this code has been invested with the character of finality and fixity. Happiness notoriously varies with the conditions and circumstances of a person, as well as with the conditions of different people and epochs. That being the case, how can humanity endure this code of eternal laws, without being cramped and without being crippled? I have, therefore, no hesitation in saying that such a religion must be destroyed, and I say there is nothing irreligious in working for the destruction of such a religion. Indeed I hold that it is your bounden duty to tear off the mask, to remove the misrepresentation that is caused by misnaming this law as religion. This is an essential step for you. Once you clear the minds of the people of this misconception and enable them to realise that what they are told is religion is not religion, but that it is really law, you will be in a position to urge its amendment or abolition. So long as people look upon it as religion they will not be ready for a change, because the idea of religion is generally speaking not associated with the idea of change. But the idea of law is associated with the idea of change, and when people come to know that what is called religion is really law, old and archaic, they will be ready for a change, for people know and accept that law can be changed.